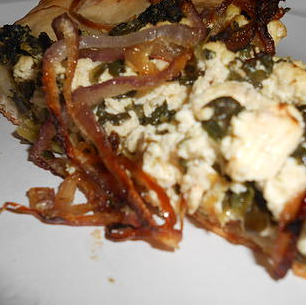 Tofu & Spinach Galette - Vegans Eat What? Vegans Eat What? This savory free-form pie is delicious and can be made successfully by even the most novice cook! Preheat your grill to medium-high or oven to 350. Between two sheets of parchment, roll the prepared dough out to a size that is slightly larger than the perimeter of the pizza pan. Put aside. Place 2 tablespoons of olive oil and the sliced red onion in a pan over medium heat. When the slices begin to sizzle, add a pinch of sea salt and sauté until wilted, about 4 to 5 minutes. Meanwhile in a bowl combine the tofu, extra virgin olive oil, lemon juice, garlic, salt and pepper and drained spinach. To assemble the Galette, spoon the tofu/spinach mixture evenly over the dough leaving 1 inch exposed around the rim. Spoon the onion slices on top. Fold the rim up over the pizza, but leaving the filling exposed. Grill with cover closed for 25 to 30 minutes, checking periodically or bake for 35 minutes, until slightly brown. Slice and serve hot. This recipe is from chef and author Christina Pirello.